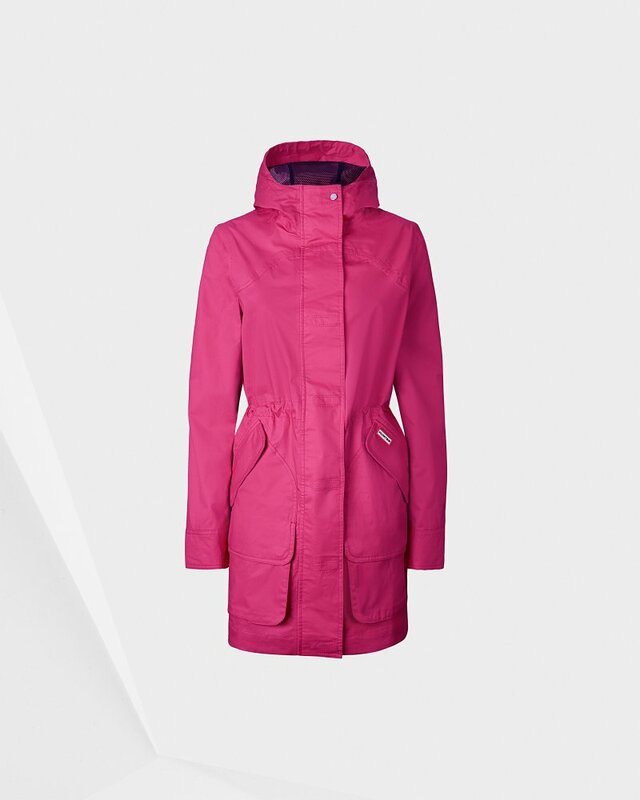 The versatile Cotton Hunting Coat in bright pink offers year round protection with a smart design that works with your lifestyle. Highly waterproof, protection is enhanced on this women's waterproof coat by applying a durable water repellent finish, while the cool cotton construction and mesh lining ensures breathability on warmer days. Secure storage can be found in the double entry hunting pockets, and the adjustable hood and cuffs help to keep the elements at bay. Rated 3 out of 5 by Aileen from Same price as Gortex but not as good Very nice coat but not as waterproof as I had hoped, 45 minutes in rain and leaking. Disappointing as would have expected more of a £200 waterproof. Comfortable to wear and nice style. Wouldn't have minded an inside pocket. Would absolutely recommend if arent particularly wearing as a rain coat. Rated 5 out of 5 by Lozz from Hunting Coat I am so happy I ordered my red hunting coat, I am off to France tomorrow and can't wait to try it out with my Hunter boots. The quality is just superb!! Rated 5 out of 5 by Lozza from Great styling and protection I bought this just over a month ago and did not go wrong! It’s perfect! Fits great and keeps the rain out! Rated 4 out of 5 by Lou3 from Comfortable waterproof Bought this product in a bigger size so as I could wear a sweater underneath. Glad I did as I find it cold if worn with a T-shirt or shirt. Rated 5 out of 5 by Tinasurfa from Best raincoat I bought this jacket for walking my dog, but it's so beautiful I am going to weare it everywere. Just love it. Love the color!